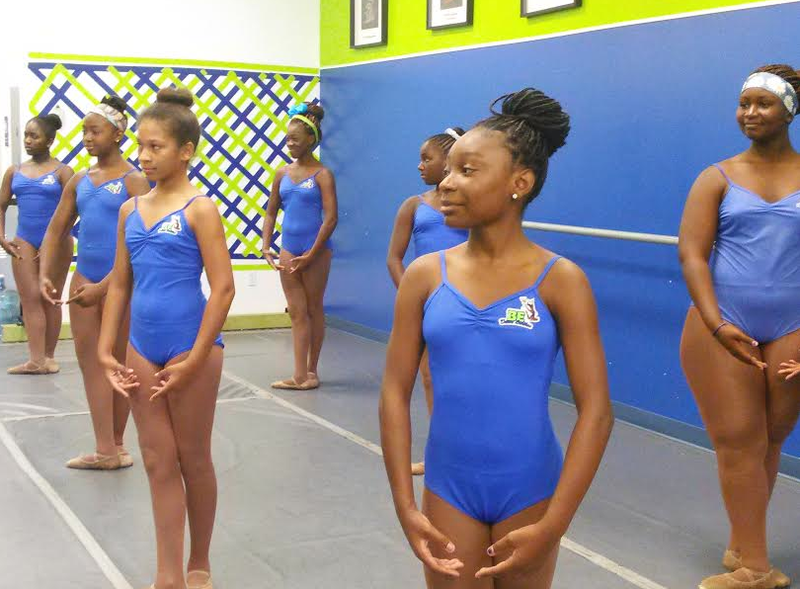 Ballerina Michaela DePrince teaches young dancers at Be Dance Studios in Miami Gardens. Hear Michaela DePrince teach class and talk about some of the challenges black ballet dancers face. Every time the young dancers at Be Dance Studios in Miami Gardens walk into class, they see a framed photo of ballerina Michaela DePrince leaping into the air hanging on the wall above the ballet barres. But on this day, DePrince is here in person, teaching them. DePrince is a former principal dancer with the Dance Theater of Harlem. Now she’s with the Dutch National Ballet in Amsterdam, where she’s the only black ballerina in the company. She walks the dancers though a warm up exercise at the ballet barre. “Tendu, Plie. Tendu,” she says as she walks around the room correcting feet and shaping arms just so. Right now, there’s a national conversation happening around the lack of diversity in ballet. American Ballet Theater, one of the oldest and most respected ballet companies in the country, just appointed its first black principal ballerina­ — Misty Copeland, but black ballerinas in classical ballet are still not a common sight. In Miami Gardens, Perpetua Phillips, owner of Be Dance Studios, says she wants to shatter the stereotypes typically associated with ballet. That it’s for white people or people with fair skin or “it’s only for the rich or it’s only for someone who grew up in a certain environment or background,” she says. Jendaya Phillips, 19, is one of the dance students taking DePrince’s ballet class. She say she wants to audition for a performing arts college, but she questions whether she’ll fit into the ballet world. “Being African-American, but as well as being a heavier girl, not being a size zero… in dance it can be pretty nerve-wracking,” she says. Young dancers at Be Dance Studios in Miami Gardens take a master class taught by international ballerina Michaela DePrince. When those negative thoughts creep in, she says she thinks about DePrince and how she made it from an orphan in war-torn Sierra Leone to acclaimed ballerina. DePrince tells the dancers to dream big and pursue this art form because it’s worth it. “Of course there are always hard times, but if you want something, go for it,” she says. She’s honest about the struggles that have little to do with talent for black ballet dancers. “You don't see dark dancers, and dark dancers really stand out. You know sometimes they have to powder your skin because you have to be a little lighter on stage,” she says. Some of the slights are subtle. For example, the basic ballet uniform was not meant for girls with dark skin tones. The pink tights and shoes were meant to compliment very fair complexions. DePrince says she has to ignore those comments and just do what she loves— dance and encourage aspiring dancers to do the same. As class winds down at Be Dance Studios, Jendaya Phillips, the 19-year-old who wants to be a professional ballerina, says DePrince motivated her to put aside her doubts of making in ballet. And every time Phillips walks into the studio, she’ll see the framed photos of DePrince, of Misty Copeland, of Christina Spigner — all black ballerinas and a reminder that black girls do ballet too. Before the pianist plays the final arrangement, Damion Bradbury stands in the front row of the New World School of the Arts dance studio towering over most of his fellow dancers at 6'4". His feet are tuned out in a “V” shape, first position. His long arms hang by his side. The piano notes waft through the room. Gerard Ebitz, a ballet teacher at the school, talks the students through what will be the last reverence at New World for the 2015 senior class. There is a solemn feel to this dance sequence performed at the end of every ballet class. Nora Chipaumire is in the middle of a dance workshop at the Kendall Campus of Miami Dade College. She asks about 12 dance students of different races to define what it means to be a black man in America -- an especially weighty topic right now. Many of the students are hesitant to try to describe the black male experience. "I’m saying, let's go into places of inquiries," she says. Art should be accessible to everyone - that is the idea being promoted by the Frost Art Museum, which is creating a space for children with special needs to explore the arts. The museum is hosting a free community art event that will have specially designed attachments for wheelchairs and other art-making tools for children with cerebral palsy, cystic fibrosis, and other disabilities. Jordana Pomeroy, director of the Frost Museum, says museums should be accessible to everyone in the community. Y'señia Almaguer’s turquoise-colored living room in her small Miami apartment doubles as her inspiration room. A stack of art books featuring Frida Kahlo and Coco Chanel sit atop a purple and pink end table. Nearby, a towering bedazzled Santeria altar accented in gold honors Oshun, the orisha or god of love and femininity.